Reliability Monitor is an advanced tool that measures hardware and software problems and other changes to your computer. Reliability Analysis Component (RAC) aggregates, analyzes and correlates problems at the operating system and application levels. The location of Reliability Monitor data files is stored in the registry. If the monitor does not show data to you, then you will need to Enable the Data Collection Task. 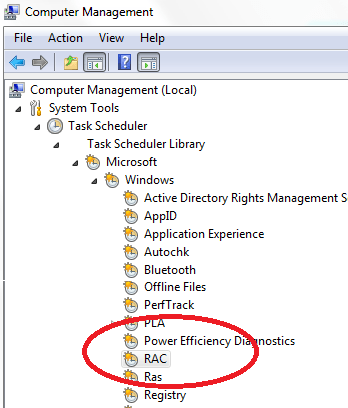 Reliability Monitor uses data provided by the RACTask scheduled task. Reliability Monitor will start displaying a Stability Index rating and specific event information 24 hours after system installation. The RACTask scheduled task runs by default after the operating system is installed. If it is disabled, it must be enabled manually from the Task Scheduler snap-in for Microsoft Management Console (MMC). Step 1: Start the Task Scheduler. you can run taskschd.msc in the searchbox, and then press ENTER (or) Right click on the My Computer, and then select the Manage option. Choose Task Scheduler. 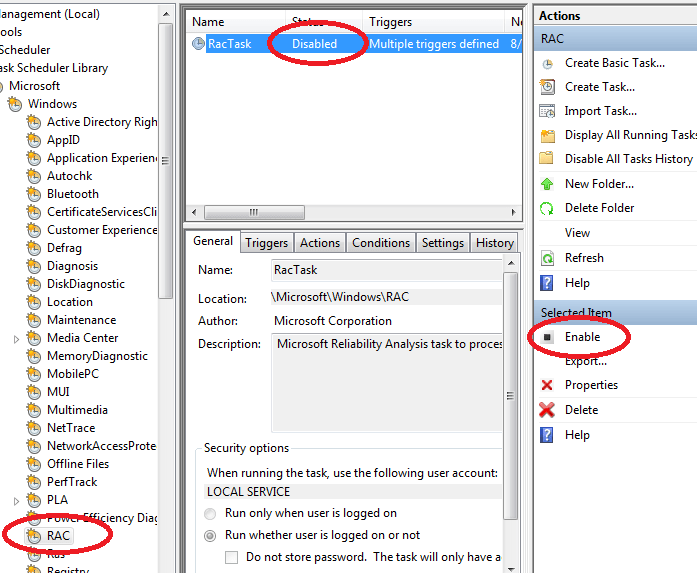 Step 2: In the navigation pane, expand Task Scheduler Library, expand Microsoft, expand Windows, and click RAC. Step 3: Right-click RAC, click View, and click Show Hidden Tasks. Step 4: Click RACtask in the results pane. On the Action menu, click Enable. Posted in Enterprise Tech, How-to, Microsoft, Tools and tagged howto, Task, Tips, Tools, TroubleShoot, Windows 7. Bookmark the permalink.